English: Olav V of Norway (born Alexander Edward Christian Frederik, Prince of Danmark) (1903–1991). 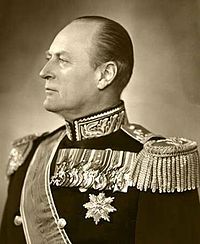 King of Norway 1957–1991. He was son of king Haakon VII of Norway and his wife queen Maud of Norway. Married to princess Märtha of Sweden. Three children; Harald V of Norway, princess Ragnhild and princess Astrid. Pages in category "Olav V of Norway"
Media in category "Olav V of Norway"